Apple Watch working on a Galaxy next? The Samsung Gear S2 is the South Korean brand's effort at bringing an attractive and functional smartwatch to the masses – and it seems that it wants to make that offer available to as many as possible. 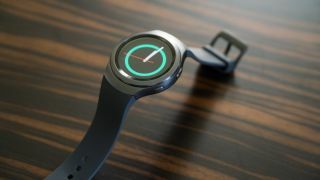 Speaking at the launch of the Gear S2, where TechRadar was in attendance, a spokesperson for Samsung confirmed that that the brand was looking at the possibilities to open [the Gear S2] up to iOS. Adding in iOS support would be a big surprise for a brand that's spent so much time and money finding ways to draw its fans away from the iPhone – but given the popularity of devices like the Pebble smartwatch because they offer iOS compatibility, opening the Gear S2 up to other markets would make sense. That impetus can only have been increased since Android Wear recently opened up to iOS – so if others are doing it in the Android space, it makes sense for Samsung to do so too. Idly looking or full steam ahead? When quizzed further on whether this was just something the brand was quietly researching or aiming to do in the near future, the spokesperson said Samsung was '"positively looking into opening [the Gear S2] up" to iOS. It seems the reason for the move is borne out of the brand looking to be more device agnostic with its wearables, as it also told Digital Spy the reason was "because we opened up to Android we are looking at [iOS]." It's unlikely that such a move would be happening any time soon though – if you are an iPhone user hankering after a cheeky bit of Samsung on the side, you can probably expect to wait until at least 2016 for the chance.